I'm bleeding, exhausted and half crazed when I finally catch sight of Ulaan Baatar. My eyes strain to focus on the haze of pollution rising from the twin smoke stacks and crumbling concrete factories nestled on the edge of the valley, hugging the south side of the city. It's a beautiful sight. I am desperate to get out of the truck. Six days earlier, I climbed into the truck in Bayan Olgii, a Kazakh state that just happens to be on the Mongolian side of the border. 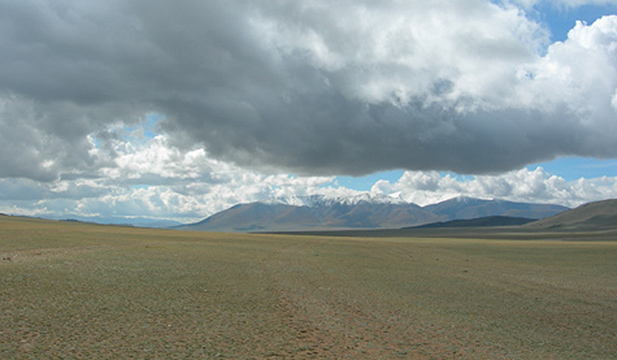 The shepherds who pass through these valleys are a curious mix of Mongolian and Kazakh. Many still call Astana (the present capital of Kazhikstan) “the capital’ even though they have never been there and are as eager to send their children off to Moscow as Ulaan Baatar for education or work. Nearly everyone over the age of twenty speaks impeccable Russian, but I have a hard time finding many who will entertain my broken Mongolian. No one knows any English but everyone wants to know how I got this far west, where I came from and how it is possible that I am so white and still don't speak Russian. The truck that has carried me all the way back to Ulaan Baatar is another hybrid. The furgon is a marvel of Russian engineering that runs on equal measures of Chinese diesel and Mongolian persistence. It's part minivan, part tank and part rhinoceros – compact, gray, temperamental and tough as hell. Not a sleek or comfortable machine by any stretch of the imagination, it lacks heating, shocks, seatbelts, airbags or upholstery but is capable of running in -30 centigrade, crossing two foot deep streams and must be started by turning the engine with a giant crank inserted in the front grill. In America, a vehicle of this size would be driven by a suburban mom with two kids and a medium sized dog, but might seat ten on a special occasion if trunk space was sacrificed for an extra row of seats. When I climb into the truck in Olgii around ten in the morning, there are two other young girls and an impatient twenty-something boy with a cell phone sitting in the back. We wait for three or four hours in the market, then begin moving house to house. Four boys headed back to university take the front row of seats, a young newly married couple stashes gifts of furniture, meat, carpets and bedding on the roof rack, then claim the driver side window seats facing each other. Next, we retrieve an old woman with two small grandchildren and a collection of thermoses and food bags. With 13 passengers, I think the truck is clearly full enough, still, all day we go back and forth from neighborhood to neighborhood in no apparent order or hurry picking up more passengers and cargo. We pick up a soldier and his friend, then the mechanic and his little brother. We trade the impatient boy with the cell phone for his grandmother and her twin nieces who joke sheepishly with the university boys all the way to UB. Last of all, we pick up a bouncy young woman dressed up like a city girl who has grown bored of visiting the countryside. She carries a massive purse filled with candy and lipstick and has packed more clothing than a family of six. She climbs into the front seat as if she owns it. When our furgon rolls out of Olgii that evening, it is packed tight with nineteen bodies plus luggage. We have more than 2,500 kilometers ahead of us, and no one seems terribly excited. I hope to sleep as much as possible. I stashed my backpack under the seat when I first got in the truck, but in the slow flurry of packing and repacking, it has been moved to the roof and is now lashed tightly beneath a tarp. All my warm clothing is in the pack. My sleeping bag has disappeared somewhere behind the back seat, buried beneath huge sacks of dried meat. All I have for the ride is the clothing on my back, a small notebook, a loaf of bread, a bottle of peach juice, a package of Chinese candies and a sac of dried cheese that I've been receiving from families throughout my last month and a half in the countryside. After the first hour on the road I give up on finding the right position in my seat. There is no comfortable way to be in a 9'x16' metal box for six days with eighteen perfect strangers with whom you share a vocabulary of less than a hundred words. I'm sitting next to the mechanic, who leaps over me each time we breakdown and is the first one loosening the lug nuts to change the continuous flat tires. Our elbows are exactly the same height. The soldier sits facing me with his back to the road. He stays in uniform the entire ride and only removes his jacket when he climbs under the truck. We both have long legs and I try not to step on his boots, but its impossible with our knees squeezed together like interlacing fingers. The grandma behind me takes advantage of the low seat back and snuggles into the small of my neck for most of the ride. She smells like rancid butter, tea and the urine of a small child. I pass hours visualizing the lice dancing from her long, unwashed braids into my greasy ponytail. My scalp begins to itch almost immediately. We drive each day for eighteen to twenty hours, stopping regularly to fix flat tires, a process that takes two hours on average and involves seven men lifting the truck because the jack isn't quite large enough. Mongolian drivers are phenomenal mechanics, even though, a shortage of high quality, specialized tools leads many towards that endearing brand of auto repair, in which nearly anything can be fixed with a wrench, a screw driver, a roll of duct tape and some wire. We drive through a landscape that should be familiar, even comforting to me by now. For the first two days we retrace the path I traveled on horseback from Khovd to Olgii when I first arrived in the west but from inside the furgon, everything looks different. Now the scenery is all out of order and I don't recognize anything. Mountains peak over the wrong valleys and the rocks shift colors too quickly. The straight drive uphill looks nothing like the circuitous route I chose, hugging the mountains and moving from family to family for three weeks. I've been told that it takes six hours to drive from Khovd to Olgii, the return trip uphill takes eight to eleven hours depending on how often the engine overheats and how many flat tires you get. When we pass the ten-hour mark and we haven't even passed Tolbo Nuur, the half point mark, I am nervous. While traveling on horse, I grew accustomed to carrying very little food on my person. If you saw a ger along the route, even far in the distance, you stopped without question. Here, on a central passage for truck moving cross-country not every home could be expected to feed travelers. Instead, one was constantly on the lookout of a guanz, mobile canteens or truck stops without roads. But when you are a group of nineteen, it is best to stop at any guanz you spot. Most are simply a home with a sign out front. If it is marked, you are welcome to stop at anytime and someone will welcome you into the house, stir the fire, make tea and give you a hot meal. A guanz is often the only home that will always have meat and where you are expected to pay for your food. If you've paid for a meal, you are free to curl up one of the beds and naps or stay the night. Some were much more permanent, and the best ones might even have room for a large group, such as ourselves to sleep. On the second night, we stop just east of Khovd at a permanent guanz. We arrive around three in the morning and find that the family has already gone to sleep, leaving the door unlocked and the room warm from a smoldering fire. Across one entire wall of the room is a raised platform about seven feet deep and twenty feet wide. The whole lot of us squeezes in and sleeps comfortably in our jackets till around six in the morning. If you haven't spooned with twenty Mongolians, you ought to try it. The mechanic lays down behind me and drapes an arm over my shoulder. I snuggle close to one of the schoolgirls. It's the only solid night of sleep I have on the trip. In the morning I finish the bottle of peach juice and decide to do a better job of rationing the bread. The candies are inedible I give them to the little girl in the back seat. On day three, we break away from the Altai Mountains and enter the plains that stretch across the belly of the country and are responsible for the long, sweeping horizons that have made Mongolia famous. The temperature drops another ten degrees. We drive for a thousand kilometers stopping only for breakdowns, flat tires and at the occasional, lonely guanz or petrol pump. As the miles float by I discuss geography, travel time and distances with the mechanic. We spend two days drawing and redrawing a map of Mongolia. I have been working on a series of hand drawn maps of Bayan Olgii for the last few weeks, but am less familiar with the topography of the rest of the country. I keep asking where the road goes, and trying to pinpoint roughly where we are. Unfortunately, the Mongolian word for “road’ is a rather loose concept in which, so far as I can tell, any spot of land can be called a road so long as a truck has crossed it in the past and it is somewhat likely that another might do the same in the future. Maps of Mongolia are notoriously inaccurate, with lines dotted into the most remote valleys and up the sides of mountains. The most popular map for cross-country travelers doesn't show any roads at all but marks the location of every petrol pump in the country. The mechanic is patient with my halting Kazakh and mostly we talk through pictures, passing a pen and pad back and forth drawing in rivers, mountains, aimag centers, horse trails and roads. I describe the bike trip that I am preparing to take from Lake Khovsgol in the far north to The Great White Lake a thousand km south. I am giving myself a month to complete the trip alone. He doesn't think I'll make it and tells me to buy a horse instead. Somewhere around day four, I lose my sense of distance completely. I think it would be possible to drive clear across Mongolia without spotting a single landmark. I spend an hour or two imagining a cross-country route in which every view would be equally scenic and thus rendered entirely unremarkable. As far as I can tell, we haven't moved in two days. We rarely pass though anything that could be considered a village and then entire cross-country route brings us through four or five small towns. There are so few roads in the country that road signs are completely irrelevant. For hours on end, there is nothing to see. I fixate on the crack in the window of the truck, the angle of the broken spring digging into my back. The door I am pressed against is hardly shut and I wonder when the latch will give. When we stop for our second meal around eight I ransack the back of the truck and dig out my sleeping bag which wasn't so far away after all. I drink three bowls or salted tea and wrap the bag around me to stop the shivering I've lapsed into for the last several hours. That night, we stop around three in the morning and everyone except the little girls and the spoiled niece climb out of the truck and immediately fall asleep on the ground. The grandmothers are given the carpets that make up the seats. I am relieved to have my sleeping bag again. I the pull cinch string completely closed and seal my self into the bag with my back to the wind. No more than an hour later it begins to rain. Dazed and damp, we pile back into the Furgon, rebuilding the seats and finding places for all our ankles and elbows and knees. The driver curses and jumps about for a while collecting his senses. Then, we drive on. The young girls demand that we stop at the next guanz for tea. Stomachs grumble and I try to fall back to sleep as the rain drips in through the broken door and continues to soak my pants. The moon sits low on the horizon and I imagine that it is the sun rising and that we are driving in circles. By the fifth day, I have sunk a little further into despondency. I fluctuate between a state of extreme calm and misery. When the furgon breaks down sometime in the afternoon, I use the four-hour stop to wander off while the boys lift the truck and bang on things. I'm not worried about being left behind. I could walk for miles and still be in sight. The temperature has warmed slight, but my clothing is wet and uncomfortable. I haven't gone to the bathroom in three days and I pick a far off spot to squat. The blood is a surprise. Usually, when I travel I don't menstruate. This confuses some people, but really is incredibly convenient. I suppose my body has become overly self-conscious with all the comments about being a young women traveling alone in Asia and has decided that it's not entirely female. The trend started when I took my first trip to India at sixteen. Now it's become something I take for granted. A few years ago, during a fourteen-month research trip to Nepal, I had my period twice. Like the rain and the cold and my perpetual headache, there is not much to be done. I use my favorite bandana to pad my underwear and sulk back to the truck. I'm so dehydrated there is not much blood, but I decide to stop drinking water until I reach Ulaan Baatar. Later that day, I wrap myself completely in my sleeping bag and have waking dreams of riding alone through the mountains, and sleeping peacefully in my tent. I need a shower, a cup of coffee, a beer and a warm bed. I'm not in a hurry, I'm not impatient. There is nobody waiting for me in Ulaan Baatar. I just can't be here anymore, in this no-place, but my chance of escape is low and would get me nowhere. I'll have to wait it out. That night, I hardly sleep at all. My spirits raise a bit when we miraculously reach a paved road, but they've sunk so low I have trouble mustering more than a smile. I'm not sure of anything anymore and don't want to get my hopes up. I've put the sleeping bag clear over my head, sealing out all light and trapping a little extra heat. My teeth have begun chattering again but the sound is muffled by the bag. I can hear my breath. I am alone at last. As the sun begins to rise, I realize that I'm stuck. I can't bring myself to come out of the bag. I unzip just enough to make a peephole from which I stare at the sand outside the window. We are moving much faster since we hit pavement. I realize that I won't come out of the sleeping bag till we reach the city, no matter how ridiculous I look. Five AM becomes six and people. The school girls talk quietly amongst themselves. The words mean nothing to me and I remain a slouched red pillow, a muppet without a face, a ridiculous scarlet blob. We stop for gas and I don't bother getting out of the truck. I let everyone climb over me. The grandmas and little girls stay inside, and even the boys stay close while smoothing their last cigarettes. As we pull out of the filling station, half the car whips out the cell phones I didn't know they had and start texting, filling the air with a chorus of clicks, beeps and jingles. Every so often, the mechanic nudges my side, and says “we're close, very close’ in Mongolian. I groan and stay hidden. The darkness helps my throbbing head. I pretend that I am sleeping.